"Very good. Well made. Easy to assemble. " The Waltons Grand Storage Unit is a compact garden tall store measuring 4ft x 2ft. The Grand Storage is a great space saving design that can easily fit into even the smallest of gardens. The shed is constructed from 28mm x 28mm framing and 12mm tongue and grooved cladding. The Grand Storage Unit is also supplied with a wide fully ledged and braced single door, which can be hung for left/right hand opening. Our garden buildings are pre-treated with a water based timber treatment for protection during transit. In order to receive the full 10 year anti-rot guarantee, it is necessary that you treat the garden building with a high quality, spirit-based, timber preservative prior to or shortly after construction. This will protect the timber from weathering and will need to be repeated accordingly in relation to manufacturer's instructions. See After Sales FAQ's for further information. Please Note:Images are dressed for display only. All buildings come unpainted and do not include featured props, tools and shelving. Review:Shed is fine. Wrong size. Review:I found this product to be shoddily put together. Screws into door and not supporting struts behind it, planks of wood with holes in it, lack of attention to construction. Generally just quite poor. Review:not yet erected so cannot comment further. Review:Very good. Well made. Easy to assemble. I am thrilled to know that you are happy with your shed and that assembly was straight forward. Thank you again for your feedback. 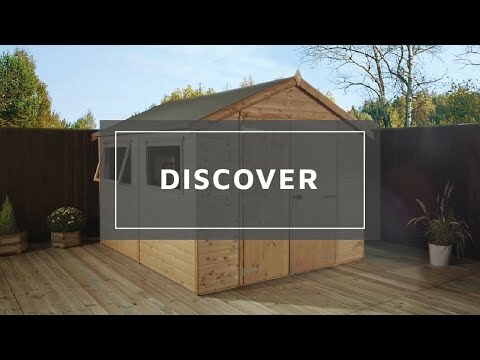 Review:I'm very pleased with the shed which I ordered. It was easy to assemble and looks amazing now that it's finished and painted with wood preserver. I am pleased to know that you are very happy with the quality and appearance of your shed and I thank you again for your great review! Review:The quality was better than we thought would be for the money. We did have to screw a batten to the wall then screw the shed to the batten to stop it falling over. The instructions were very easy to follow. Our Reply:We are glad to hear that you are happy with the quality of your product and that the instructions were easy to follow. Our Reply:We do have a Quality Team that check the buildings before despatch and I will make sure this will be looked into and measures taken to ensure the same error is not made in future. Thank you again for taking the time to provide your feedback and again please accept my sincerest apologies.